It was another beautiful day at the Westin Harbour Island in downtown Tampa this past Sunday evening for Min and Tre’s wedding ceremony. Min looked absolutely gorgeous as she was escorted by her father down the stairs and the tree lined aisle (… rockin’ her converse tennis shoes under her wedding dress!) to join Tre under their wedding arch. There, in front of their family and friends, the couple shared their vows, exchanged rings, and were pronounced husband and wife by Rev. Rick Lackore of Sensational Ceremonies, LLC . Delaynna Winters (Wedding/Special Event Manager at the Westin) and her staff did a great job of making sure that every detail was taken care of for the happy couple and their guests. 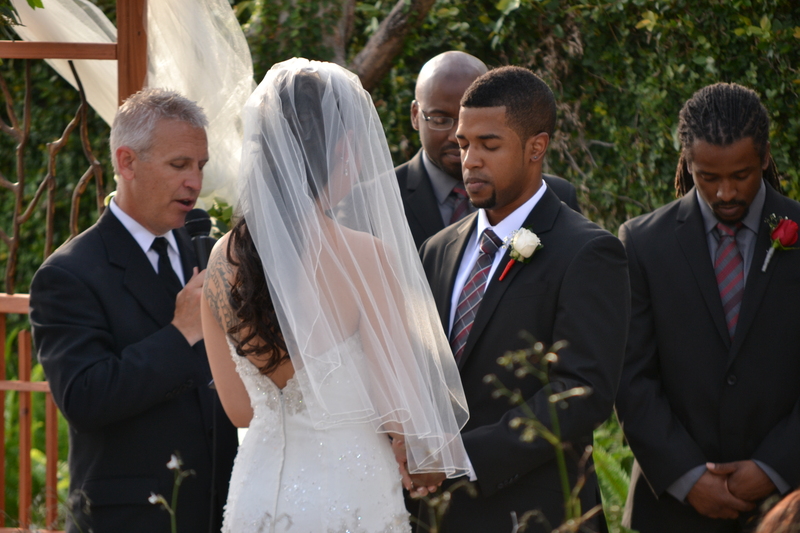 This picture of the couple during a prayer in the ceremony was provided by Tammy Lackore. Congratulations to the new Mr. and Mrs. Tre Stevenson!